The relief of avoiding the notoriously busy Park Circus seven-point crossing can now be matched by the delight of commuting from the EM Bypass till the Race Course intersection in 15 minutes. After the new ramp connecting the Parama and AJC Bose Road flyovers was opened to traffic at 6.45pm on Friday, the 6.5km commute from the Science City end of the elevated route till the Race Course became a breeze. Metro took two rides in the same direction, before and after the ramp opened. Fast-track commute The time required to travel till the Race Course intersection from the EM Bypass by car was reduced by 46.15 per cent after taking the ramp. The ride started at 6.59pm at the base of the Parama flyover near Science City. At 7.14pm, the car was standing at the Race Course signal. The only time traffic slowed was for less than 30 seconds while descending the AJC Bose Road flyover. The previous ride through both flyovers and the Park Circus seven-point crossing had taken around 26 minutes. Almost 12 minutes of this travel time was taken up by the seven-point and Circus Avenue-Nasiruddin Road crossings. The red signal at Park Circus after coming down the Parama flyover lasted around four minutes. The next one was on for two minutes. Even after the light turned green, traffic moved painfully slow until the AJC Bose Road flyover arrived. 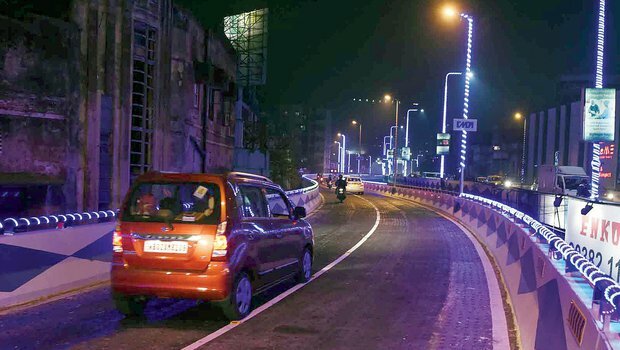 Flight above chaos The new arm branches off the Parama flyover near Topsia police station and runs over Congress Exhibition Road, Nasiruddin Road and a stretch of Circus Avenue before merging with the AJC Bose Road flyover. Before the ramp opened, going to Race Course from the Bypass meant negotiating these choke points and often getting stuck in snarls. The wait at these traffic signals would also be invariably longer than at other places. Add to this a cocktail of un- ruly traffic in the form of autos, trucks, motorbikes, scooters and even cycles. On Friday, cruising on the elevated road and seeing the chaos below felt surreal. The divider with road-marking reflectors and a string of blue and white miniature lights fixed to the railing and the lamp posts ensured ample illumination. The blue-and-white paint on the walls on both sides was fresh. The stone chips on the mastic asphalt made the ride a little jerky. But at consistent speed, it was smooth. Ramp width At first glance, the new ramp looks narrower than it should be, more so after going down the Parama flyover. A row of buildings run parallel to the ramp, their terraces and balconies a jump away. But once on the ramp, the notion is dispelled. It is enough to accommodate two lines of cars and will still have some space left on both sides, like the Salt Lake-bound flank of the Parama flyover. The prescribed minimum width for a two-lane stretch is 7 metres (3.5 metre for each lane), an engineer said. “The width of the ramp is eight metres (24 feet), enough for an arm like this that will see one-way traffic,” he said. A Mercedes-Benz E Class sedan is a little less than two metres in width.